"During the total eclipses of the sun on June 30, 1954, and October 22, 1959, quite analogous deviations of the plane of oscillation of the paraconical pendulum were observed..." - Maurice Allais, 1988 Nobel autobiographical lecture. ally brought kings to assemble armies and, in the modern era, brought camera-toting astronomers to remote locations around the world. On August 11, a solar eclipse will bring scientists together in an effort to solve a 45-year mystery. Right: When the Moon eclipses the Sun, the solar corona becomes visible. The corona is faint compared to the Sun, so it can only be seen when the Sun is blocked from view. Jean Bernard Leon Foucault, with the physicist Armand Fizeau, took the first clear photograph of the Sun in 1845. The mystery lies in the question: Does a solar eclipse somehow affect a Foucault pendulum? In 1954, Maurice Allais reported that a Foucault pendulum exhibited peculiar movements at the time of a solar eclipse. If true, his finding raises new questions about the nature of such phenomena. For the upcoming eclipse, the NASA/Marshall Space Sciences Lab is coordinating an internet and video collaboration between observatories and universities to test the Allais effect. Participants on 4 continents (Central Europe, North America, Middle Asia, and Australasia), are from at least 7 countries (US, Austria, Germany, Italy, Australia, 4 sites in the United Arab Emirates, and England) and 11 cities (Huntsville, AL, Indianapolis, Louisville, Denver, Boulder, Richmond, Vienna, Greifswald, Trento, Abu Dabi, and Sydney). 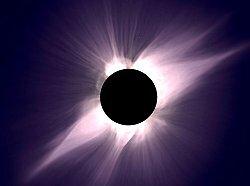 for lesson plans and activities related to the August 11, 1999 total solar eclipse. e Earth. A scientific tour de force, Foucault's demonstration forever attached his name both to the effect itself (the Foucault effect) and to the universal joint pendulum that freely swings and rotates at the same time (the Foucault pendulum). Left: Time-elapsed photo of a Foucault pendulum at the Smithsonian Museum. As the Earth rotates under the pendulum, the bob strikes down red pegs. A basic Foucault pendulum is simply a weight on a wire. Practically any pocket watch has the potential to act as a pendulum, exhibiting up to a 10 to 15 degree rotation per hour around its hinge point. To an observer in a windowless room, the rotation that accompanies the swing is a kind of optical illusion: the pendulum is not turning, instead the Earth is actually rotating under the pendulum. Foucault's dramatic proof at the World's Fair is considered to be the first non-astronomical proof of the Earth's rotation. rld, including the United Nations Building in New York and at the Smithsonian Museum in Washington. Remarkably, little more than two long-term scientific records for Foucault pendulums have been published. Both experiments were conducted by eventual Nobel Prize winners: Heike Kamerlingh-Onnes, who won the 1913 Nobel prize in Physics for his investigations on the properties of matter at low temperatures (which led to the production of liquid helium), and Maurice Allais, who won the 1988 Nobel prize in Economics for his contributions to the theory of markets and efficient utilization of resources. d nights -without missing a data point. He recorded the direction of rotation (in degrees) at his Paris laboratory. This energetic show of human endurance happened to overlap with the 1954 solar eclipse. During the eclipse, the pendulum took an unexpected turn, changing its angle of rotation by 13.5 degrees. Left: Maurice Allais (1911 - ) won the Nobel Prize in Economics in 1988. He stated, "All my researches in theoretical and applied physics which, at first sight, appear to be remote from my main activity as an economist, have, in reality, enriched me with valuable experience." Right: Foucault clock animation - each tick shown is one hour worth of observed rotation. Depending on geographic position, the rotation of the Earth on a Foucault clock can be measured as different rotation rates: infinite period at the equator; approximately 24 hours at the poles; clockwise in the Southern Hemisphere; counter-clockwise in the Northern Hemisphere. The Allais effect observed over 2 and an half hours during the shadow of an extended solar eclipse's onset and departure equals nearly the magnitude of the Foucault effect itself (or about one tick shown). Allais' pendulum experiments earned him the 1959 Galabert Prize of the French Astronautical Society, and in 1959 he was made a laureate of the United States Gravity Research Foundation. YES: Allais' original observations were repeated 3 times in 1954 and 1959 in France. In two locations: "two identical installations at St. Germain and Bougival, in an underground gallery (57 m deep) showing that the previously observed anomalies are still present." Allais, 1959. NO: Given a null report in 1954 in Shetland, Scotland using static gravity meters, and in 1965 in Trieste, Italy. pendulum YES: Allais effect repeated using a torsion pendulum. In the observations at Harvard, a 0.0372% increase in the period (29.570 second baseline) began with the eclipse onset, peaked just after the eclipse maximum (29.581 second max.) and then decreased to an offset value. The researchers conclude that "this agrees qualitatively with the work of Allais with a paraconical (Foucault) pendulum. The change of azimuth increased substantially in the first half of the eclipse of June 30, 1954." These effects manifest as an "apparent wavelike structure observed over the course of many years at our Harvard laboratory. It cannot be predicted on the basis of classical gravitational theory nor has it been observed in the quasistationary experiments underlying this theory (e.g. spring-operated gravimeters, seismographs, and interferometer devices)." Saxl and Allen, Phys. Rev. D3, 1971.
pendulum NO: Not observed in 1990 Finland eclipse using a torsion pendulum. "In July 1990 there was a total solar eclipse in Helsinki, Finland. The results of Saxl and Allen, made at Harvard University during the total solar eclipse in March 1970, were tested using equipment which was quite similar to that used in Harvard. Four measurements, each lasting nine hours, were performed during the night preceding the eclipse, during the eclipse and the night after the eclipse and two weeks after the eclipse. In the limits of errors no effects were observed." Ullakko, et al, 1991. MAYBE: The team that conducted the Finland 1990 study detected an indefinite signal one year later in Mexico City. "In the y-position of the pendulum there are two distinct shifts which seem to appear at the beginning and the end of the eclipse... Our experiment cannot determine whether these shifts are produced by some eclipse-coordinated phenomena, e.g. some sort of tidal waves on the shell of the Earth which has altered the position of the pendulum system." gravimeter YES: A gravimeter detected slight changes during a solar eclipse. "[A one hour feature of the gravimeter record] of 10-12 microGal (10-8cm/s2)...can neither be classified under short period variations due to tidal effect or drift of the gravimeter nor under high frequency noise which have special patterns. Therefore, this variation is highly significant as it occurs with the onset of an eclipse...to understand its actual nature and mechanism, more planned experiments of this kind should be carried out during solar eclipses throughout the world whenever such opportunities are available." D.C. Mishra, M.B.S. Rao, National Geophysical Research Institute, Current Science, 72 (11) 1997 (783). "The initial interpretation of the record points to three possibilities," says Dr. David Noever of NASA/Marshall, "A systematic error, a local effect, or the unexplored. To eliminate the first two possibilities, we and several other observers will use different kinds of measuring instruments in a distributed global network of observing stations." g and then verifying the effects of a solar eclipse is a difficult enterprise. Because an eclipse has a short duration, it is difficult to conduct very many tests. Also, eclipse effects usually get attributed to some local effect like seismic or temperature changes because the experiments are not conducted in several different places at once. Therefore, in order to determine whether or not the effects of any single eclipse are one-time, localized events, many observing stations are needed to test eclipse peculiarities. During the next solar eclipse, Noever's team and volunteer scientists at several museums will simultaneously observe Foucault pendulums. Noever and other scientists will also use a gravimeter - a super-sensitive device that reports very small changes in the gravitational force acting on a mechanical spring. After the eclipse, Noever's team will compare the results of all the tests, including observations from areas in Europe that lie in the path of the eclipse. Left: Cutaway view of gravimeter, with magnetic, thermal and pressure shielding. The instrument reports very small changes in the gravitational force acting on a mechanical spring-mass. Gravitational changes are expressed as the electrical force (measured as voltage) required to maintain the spring-mass system at a predetermined position (the null point). The modified LaCoste-Romberg gravimeter (Edcon, Inc. Denver, CO) measures relative gravity until calibrated against a reference. The instrument is routinely calibrated along the 10-station Rocky Mountain Calibration range established by NOAA, Edcon and the Colorado School of Mines. The calibration is validated by comparing the measure of absolute gravity in Huntsville Alabama with reference values from the USAF gravity disk. Data collection begins on August 11. The times of the solar eclipse are 3am-9am in North America, and 9a.m.-3p.m. in Europe and Middle Asia. These times can be adjusted for exact locations, for instance, in Boulder, CO, a data set for recording would be about 2:30a.m., continuing until 8:30a.m. That would cover the approach of the shadow, the actual eclipse, and the retreat of the shadow. The total length of the eclipse from initial contact in the Atlantic to last contact in the Indian Ocean is about 3 ½ hours. If the scientists do observe the Allais effect, the prevailing question will be "Why does it occur?" So far, explanations have included the anisotropy of space (the condition of having different properties in different directions), gravitational waves, and solar radiation. The Foucault Pendulum -- an excellent tutorial discussion by Professor B. Nickel, Physics Department, University of Guelph, Ontario, Canada. This web site also reviews some peculiarities in pendulum motion detected by experiments at the University of Guelph. Peering Through a Hole in the Sky - June 17, 1999. The Millenium's Last Solar Eclipse - Sky & Telescope magazine. Fred Espenak's Solar Eclipse Home Page - at the NASA/Goddard Space Flight Center. But before the cause of the Allais effect can be determined, scientists first need to settle the question about whether a pendulum really does act differently during a solar eclipse. By having a global network of scientists collaborating on a single eclipse, the answer to that question will perhaps finally be resolved. Results of August 11 eclipse will have to be coordinated with lunar opposition (2 weeks later) before a first summary of eclipse data will be available. Realistically, scientists think it will take at least a decade before all opinions are settled. In his Nobel Prize autobiographical speech, Allais stated, "My main idea at the start was that a link could be established between magnetism and gravitation by observing the movements of a pendulum consisting of a glass ball oscillating in a magnetic field. Of all the observations made in 1952 and 1953 I was not able to draw any definitive conclusion. Through certain experimental devices, I obtained positive effects, but with other devices I obtained no effect whatsoever....all these phenomena are quite inexplicable within the framework of the currently accepted theories." Upon learning of the upcoming effort to investigate the pendulum-eclipse mystery, Allais said he was glad and excited that scientists are revisiting his experiments. The German rocket scientist Werner von Braun, one of the original rocket team members at NASA's Marshall Space Flight Center, had encouraged Allais to translate one of his pendulum experiments from French into English. Von Braun, it seems, believed the experiment could explain anomalies in some space object trajectories. When the pendulums start swinging on August 11, the early connection between Allais and NASA/Marshall will have come full circle. Although much of Europe, Asia and Africa will witness the eclipse, only those who lie directly under the path will see a total eclipse. Other than partial coverage at dawn in the Northeast corridor, North American sites appear in opposition to the ground shadow. But if effects have a gravitational origin, previous studies would indicate any detection may depend more on instrument resolution. To better than one part in 10 billion, no evidence of material shielding of gravity has ever been detected. The Dark Side of the Eclipse - Science, July 2, 1999. Mephistos UCLA - With Pasteur and Darwin, Foucault ranks as one of the top three scientific influences in 19th century science. Big Bang Acceleration -- Observations of supernova explosions halfway back to the Big Bang give plausible evidence that the expansion of the universe has been accelerating since that epoch, approximately 8 billion years ago and suggest that energy associated with the vacuum itself may be responsible for the acceleration. The screen effect of the earth in the TETG - Theory of a screening experiment of a sample body at the equator, using the earth as a screen. M. Allais, French Academy of Sciences: C.R.A.S. (1959) 245, 1875; 245, 2001; 244, 2469; 245, 2467;245;2170; in English in Aero/Space Engineering, September and October, 1959 (18, (9) and (10). L. Jun, L. Jianguo, Z. Xuerong, V. Liakhovets, M. Lomonosov and A. Ragyn, Observation of 1990 solar eclipse by a torsion pendulum, Phys. Rev. D, 44(8), 2611-2613, 1991. T. Kuusela, Effect of the solar eclipse on the period of a torsion pendulum, Phys. Rev. D, 43(6), 2041-2043, 1991. T. Kuusela, New measurements with a torsion pendulum during the solar eclipse, General Relativity and Gravitation, 4, 543-550, 1992. D. C. Mishra, M. B. S. Vyaghreswara Rao, Temporal variation in gravity field during solar eclipse on 24 October 1995, Current Science, 72(11), 782-783, 1997. L. A. Savrov, Experiment with paraconic pendulums during the November 3, 1994 solar eclipse in Brazil, Measurement Techniques, 40 (6), 511-516, 1997. L.B. Slichter, M. Caputo, and C.L Hager, J. Geophys. REs. 70(6),1541-1551 (1965). E. J. Saxl and M. Allen, 1970 solar eclipse as 'seen' by a torsion pendulum, Phys. Rev. D, 3, 823-825, 1971.